Over time, the Roman Empire transformed also in art and culture. There was a new religious unity in Christendom with cultural and artistic implications. But there was also the fluctuation of the Celtic, Slavic, Germanic, and Islamic conceptions of art and culture. Europe became in the truest sense a cauldron; a crucible of cultures. The blend which came out of the melting pot was unique in different countries and times. In some regions the Germanic flavor was more dominant; in others, the Celtic, and in the south the roman ingredients stayed dominant. All this led to the ever changing brilliant flowering of western culture with a variety of aspects. 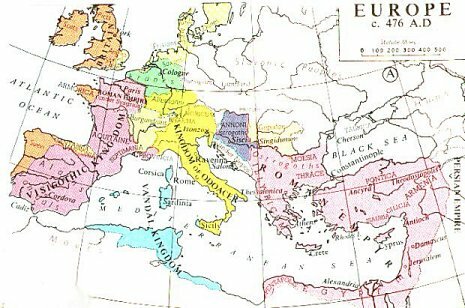 Around 1000 the West had already some so-called renaissances and was now on the brink after dissipating and mixing with the Roman heritage to launch a new Western culture. Spain with its brilliant three cultures and religions was the perfect example of this crucible. Around 950 Cordoba as an international capital stood at its apogee. It was the perfect example of the mixing of different cultures and religions in that it produced a really Grand Crucible.